Wow your friends and family by creating this dine-out favourite at home with this Smoky Pulled Pork Sliders recipe base. Spices, including smoked paprika, cumin and coriander, have been carefully blended so you get the right flavour kick every time. If you’re not a pork fan, simply sub in chicken to create delicious Smoky Pulled Chicken Wraps. Spices [smoked paprika^ (11%), cumin, coriander seed, fennel, pepper, mustard], sugar, vegetable powders (tomato, garlic, onion), corn starch, maltodextrin, salt, natural flavours, chilli powder, yeast extract, vegetable gum (xanthan). ^ From responsibly grown smoked paprika. Contains naturally occurring glutamates. Instructions for Use Just add… 2 Kg boneless pork shoulder, rind removed and excess fat trimmed 1 pack Continental Recipe Base ¼ cup (60mL) apple juice ¼ cup (60mL) barbecue sauce ¼ cup mayonnaise 4 cups shredded cabbage 6 spring onions, sliced 1 cup grated carrot 8 bread rolls Preparation time: 20 minutes Cooking time: 5 hours Slow Cooker – for best results 1.Place pork in the bowl of a slow cooker and rub with Recipe Base. Add combined apple juice and barbecue sauce. Cover and cook on HIGH for 5 hours, turning once during cooking. 2.Combine mayonnaise, cabbage, spring onions and carrot in a bowl. Refrigerate until needed. 3.Remove meat from slow cooker and use 2 forks to pull apart the meat. To thicken the cooking sauce, transfer into a large saucepan and bring to the boil. Simmer until thickened and reduced by half. Combine sauce and pulled pork and serve in warm bread rolls with coleslaw. 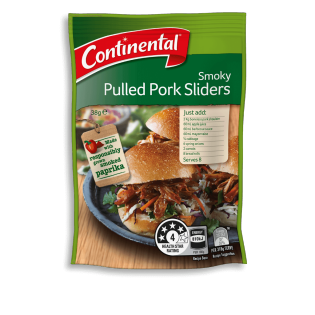 Sorry to break it to you, but our Pulled Pork Sliders Recipe Base has been deleted due to poor sales & low distribution. Sorry to disappoint you once again, but this has also been deleted from the range. We'll make sure this gets to Marketing. Absolutely love this mix- and found out today IT'S gone! I had bought so many ahead and now down to my last 2, going to eat them very slowly! Very disappointed with the slow cooker range this year, and now to lose our family favourite! I am so DISAPPOINTED THAT THIS HAS BEEN PULLED FROM YOUR RANGE. i HAD BEEN BUYING SEVERAL PACKETS AT A TIME AS THIS IS ONE OF THE BEST SLOW COOKED PORK SPICE BASES I HAVE COME ACROSS. i HAVE USED MY LAST ONE AND COULD NOT FIND IT IN ANY STORE. Hi Ron, we are very sorry to hear that this product deletion has caused such sadness, this was certainly not our intention! We will pass your request through to our marketing team and see what they think. Sorry Susan but our Pulled Pork Recipe Base has been deleted from the range due to poor sales & low distribution. We will pass your lovely feedback along to the team. Where do you buy this??? Ive tried every supermatket i can think of !!! Sorry to break it to you, Denise but this has been deleted from the range. THIS RECIPE BASE IS AMAZING! ALWAYS A HIT AT MY HOUSE. BUT I CAN'T SEEM TO FIND IT IN THE SUPERMARKETS LATELY! PLEASE TELL ME YOU STILL MAKE IT!!!!!!! Hi, thanks for your great feedback, Unfortunately there were not many of you out there & this was deleted due to poor sales & low distribution. We will pass your feedback along to the team.